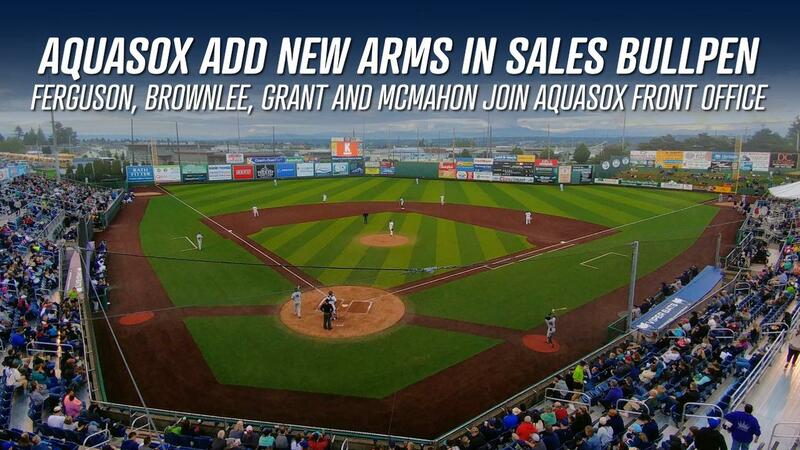 Everett, WA - The Everett AquaSox are excited to add Dan Ferguson, Scott Brownlee, Conner Grant and Kieran McMahon to their sales bullpen. Washington State University pipeline continues to stock the AquaSox Front Office. Ferguson joins the AquaSox as the Director of Tickets after spending the past three seasons working with the Walla Walla Sweets where he held multiple positions including General Manager for the 2018 season. Dan brings years of experience working with multiple clubs. Brownlee enters his first full-time season as an Account Executive after previously serving as a Stadium Operations Assistant last season. Scott graduated from Washington State University in 2017 with a degree in Communications and is currently finishing his second degree in Sport Management. Grant recently graduated from Washington State University with a degree in Sport Management and minors in Business and Communication. Conner joins the AquaSox as an Account Executive. He is a huge Seattle sports fan and loves the Washington State Cougars! McMahon joins the AquaSox sales bullpen as an Account Executive after spending the past year working in radio. He graduated from Washington State University in 2017 with a degree in Political Science. Prior to working in radio, he spent five months traveling Central and South America. Fans can place deposits for 2019 full season tickets, suite rentals, picnics or group outings by calling (425) 258-3673 or visiting the AquaSox Front Office at 3802 Broadway in Everett.